Call it heroic or barbaric. Call it strategic or suicidal. Call it whatever you want. But there can be no doubt that the chief reason for the improbable rally in newspaper stocks last year was the industry’s ability to radically shrink its cost structure. Investors shrugged off the bleak ad picture to focus on the future profit prospects for an industry that showed it could chop expenses almost as fast as revenues fell. Three publishers – Lee Enterprises, McClatchy and Media General – actually were able to reduce ongoing operating expenses faster than their sales shrank in the first nine months of 2009. Thus, as detailed in the analysis below, they produced fatter margins on their ongoing operations in 2009 than they did in the prior year. On its continuing operations, Lee boosted its earnings before interest, taxes, depreciation and amortization (EBITDA) to 26% in fiscal 2009 from 20.5% in the prior year. McClatchy upped its EBITDA on continuing operations to 23.5% in the first nine months of the year from 17.5% in 2008, and Media General lifted its EBITDA to 14.8% in the first nine months from 12.6% in the prior period. Wall Street rewarded the companies in 2009 by boosting their shares by respectively 746%, 342% and 348%. Deep, wide, mostly permanent and almost always painful, the industry’s extreme cost-cutting last year attracted the attention of investors because the radical and seemingly permanent restructuring suggests publishing profits have a fair chance of increasing when the economy improves and advertising sales revive. If newspapers keep the lid on expenses when sales rise, the thinking goes, most of the upside will go to the bottom line. There is a big, fat gotcha to that reasoning that we’ll discuss in a moment. But let’s take a quick look at how last year’s surprise rally unfolded. Newspaper stocks, which formerly had been prized for their rich and reliable profits, were hammered to all-time lows in the first months of 2009 at the same time the stock market as a whole swooned in a global economic panic. Newspaper issues were beset by not just the grim outlook for the over-all economy but also by the worst plunge in newspaper ad sales in recorded history. The reluctance to invest in publishing stocks in the early part of the year also was fueled by very real concerns about which publisher would land next in bankruptcy court. The Tribune Co. set the tone for terror when it filed for bankruptcy protection from some $13 billion in debt in December, 2008, just days short of the first anniversary of the take-over of the company in a recklessly financed deal. Although Tribune was the largest and most prominent example of what could happen to a publisher over-burdened with debt in the worst ad recession in history, it was far from unique. Half a dozen other newspaper publishers filed Chapter 11 in the last two years and it looked for a while as though there might be more. At precisely 4:24 p.m. on Dec. 31, 2008, Lee’s auditors warned the company might default on $1.4 billion in debt, dropping its shares at one point in the early days of the year to a low of 24 cents. But the company managed to restructure its debt by February and embarked on a cost-cutting campaign that led to a remarkable rebound in its shares by the end of the year. Lee rose 746% in 2009 to close at $3.47 per share, although it remained 90.4% below the $36.00 it fetched on Dec. 31, 2005. The ability of several other highly leveraged publishers to steer clear of bankruptcy gave extra lift to newspaper shares after the stock market bottomed in March and began the climb that continued through the balance of the year. The shares of GateHouse Media, which traded as low as 4 cents in the early days of 2009, popped nicely in May when management announced not only an aggressive plan to cut costs but also a vital agreement to refinance its heavy debt at a discount over the next three years. By cutting costs and dodging bankruptcy, the company’s stock rose 400% last year to 20 cents a share. However, that’s still 98.9% less than the $18.65 it was worth at its initial public offering in 2007. 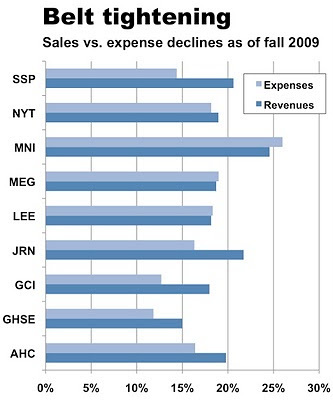 Whether financed precariously or not, publishers across the board took cleavers to their expenses throughout 2009, shrinking headcount, reducing benefits, trimming circulation, squeezing newshole and outsourcing everything from payroll and customer service to ad composition and printing. If sales don’t rebound in 2010, there may be more. Industry profits were depressed last year not only by its hefty legacy expense structure and the epic meltdown in ad sales but also by such one-time charges against earnings as the loss of value on overpriced acquisitions, severance payments and such other restructuring costs as plant shutdowns. To get a better sense of how well publishers have restructured for 2010 and beyond, I stripped the one-time charges out of last year’s expenses to produce the table below, which shows the amount publishers cut operating expenses in relation to the slide in their sales. In the analysis, McClatchy surpassed the other publishers by cutting ongoing operating expenses by 26% in the first nine months of the year while sales fell 24.6% in the period. Media General pared ongoing operating costs 19.0% vs. an 18.7% decline in revenues, while Lee trimmed expenses 18.3% vs. an 18.2% drop in sales. As noted at the outset, this enabled the three publishers to increase their profit margins on continuing operations in the spite of the odds arrayed against them in 2009. Their stocks, as well as those of most other newspaper publishers, rose dramatically in 2009 because investors can imagine handsome increases in profitability as soon as newspaper advertising recovers. And that’s the gotcha that could unravel their investment thesis. Historically, advertising has rebounded in concert with the economy. But, as discussed more fully here, major secular changes in consumer and advertiser behavior were well under way before the economy began to crater. Thoughtful investors also have to be concerned about whether the severe cost cutting at most papers has diminished their value to the discerning readers who historically have been their best customers. If readership and advertising demand fail to rebound when the economy does – or, worse, continue to contract as steadily as they have in recent years – then even the most disciplined newspaper publishers will run out of discretionary costs to cut to preserve the profitability of their businesses. Smart investors know this and will be watching closely, poised to dump newspaper shares at the first sign of trouble. I found this a very on-mark analysis, especially concerning the poisoned legacy of the cuts publishers now face. One result of this recession has been the wiping out of fact-checking copy editors, etc., coupled with print-first, fact-check and correct later that is driven by the new technology. But it seems correct later has been dropped because I'm finding major errors of fact, and huge holes in stories in my local paper (the Washington Post) that would not have appeared three years ago. Simple things, like not giving charges against people who are arrested, etc. Copy editors who used to catch these things will not be brought back with the (alleged) economic recovery. Eventually, there will be a backlash from both readers and advertisers unless attention is given to quality. Spot on analysis as usual Alan. Still, in addition to across the board cost cuts there has been a permanent change in the way some newspaper groups like Lee and McClatchy do business. The old model of "inventing" everything locally even when no compelling local angle exists is giving way to sourcing high quality niche content externally. The newspapers (and their Web sites) get content that is often better presented than their own at bargain basement prices with no sacrifice in accuracy or quality editing. Readers get well-told stories that report on real news in areas of special interest with strong reader appeal that the papers used to ignore. Advertisers get a strong, positive vertical selling environment that helps them reach and influence targeted customers. Finally, investors get the lasting benefit of economy of scale. ". . . as well as the endless array of articles in the press bemoaning the industry’s plight. (Note to newsies: You don’t see Chrysler continuously taking out newspaper ads saying how screwed up their company is, do you?)" How about more analysis from the other end of the scale: the consumer? What about all the unemployed/underemployed/retirees on low fixed income? If no one can afford widgets, there goes the widget factory. That's secular change you can't ignore. If I had the disposable income I would subscribe to a newspaper and have cable/satellite TV. I only spend twenty dollars a month for an internet connection that gives me all the news, info, and entertainment I could ever want. I agree with all that you say, and blame a large part of the results on the lack of major analysts who follow the newspaper industry. The large stockbrokers dropped the news industry as being of interest to investors a couple of years ago. They saw it then as a declining industry. This has left only some smaller companies following the industry, with the result that investors are making investment decisions largely on their own. The results of the cost-cutting looks impressive on the books and investors are betting that newspapers will bounce back like major manufacturing concerns when the recovery comes. The industry needs a serious analyst to point out the potential downsides. I think this post indicates there still is a sweet spot somewhere for news organizations. A good business model is out there.